For the ultimate in clean air and complete comfort, put the proven antimicrobial power of UV light to work for you. 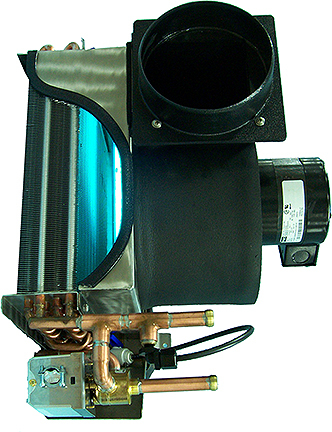 Blue-V by Technicold is available as an option on Technicold draw-through or blow-through air handlers, 8000 – 32000 BTU. Blue-V is a clean, economical safeguard against air borne contaminants. Blue-V’s UV light inhibits mold and algae growth in the evaporator, blower housing and drain pan. Unlike the competition, which offers UV bulbs only in the ducting, Technicold installs Blue-V directly in the air handler; virtually eliminating all microbes. The musty smell and poor air quality associated with some on-board air conditioning systems are not a concern with Blue-V equipped Technicold products. Like all Technicold-backed products, Blue-V is ingeniously simple, while built to thrive in the harsh marine environment. The climate solution experts at Technicold design the Blue-V installation that is best suited for your vessel’s HVAC system. Installing Blue-V in the air handler saves valuable space without restricting your ducting options. Choose the peace of mind that comes with owning the best – choose Technicold by Northern Lights.